Are we aiming too low? - esther derby associates, inc. I spent a couple of days with the web crowd last week at Web Directions in Atlanta. Design matters on a website, where attention to user engagement can mean the difference between a flop and a million dollars. I live in the software world, mostly around agile software development. When I talk about agile (and I think this is generally the case), I talk about benefits to the business and benefits to the team (though creating great teams has a business payoff as well). We talk about a close relationship with the customer or product owner. I don’t know about you, but I’ve met lots of customers who know what they want, but not what they need. And I’ve met product owners who don’t know much about interface and interaction design. I don’t say that to blame them. Aarron Walter (@aarron) had a little graphic that crystalized what I’d been thinking. I’d like to collect some more information. How has your team incorporated UX/ID into short iterations? We like to have iteration 0’s in that we have a design iteration up front! The team I’m working with now has started using Balsamiq to create low-fi prototypes that they get direct customer feedback on. Given the current state of the organization, the best we can support now is a sprint of analysis and mockups followed by implementing the scenarios. Over the last month or so we’ve been focusing much more on thinking about how the user is using the software and getting rapid feedback before releasing but it’s taken a looooong time to get to that point. The “business” and customers are finding this change in behaviour valuable so far. The power & simplicity of Aarron Walter’s pyramid is compelling. Thanks for sharing it Esther! Most of the developers I work with concentrate on functional & reliable. And, there do a good job of it. This has been a huge benefit from Agile/XP teachings, specifically TDD. 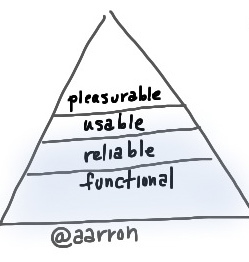 The better developers I work with consider usability as part of the craft. I yearn for the ‘pleasurable’ in software. Personally, I like to extend the idea of pair programming to design and code. For me, it’s all about the collaboration. I take JIT design literally, and prefer to spend half my time during the sprint, working directly with developers side-by-side or interacting over a whiteboard. 10% up front design, big picture framework, personas & scenarios, at the release level. Includes research & analysis, understand the customer, what’s the target. 25% before sprint, work out user flows, business logic. Documentation is whiteboard pics. 50% during the sprint, make detailed design decisions immediate and in context. Lots of guerilla usability testing. 15% post sprint, light weight usability testing (think Steve Krug). Insights feed back into the process. This last part, post-sprint feedback, is what I find most lacking in agile implementations. Agile is supposed to be incremental and iterative. We’ve done really well on incremental, not so good on iterative. One root cause is that done done is meaningful in development. Code can be tested, you pass or fail. Not so with design. Done is just another step in the design discovery process. You finish it, put it in front of users, learn a bit more, and refine the design. But how does that feed back find its way back into the sprint? Technically, it just goes on the backlog and gets prioritized. But there are two problems with this theory: focus and tools. 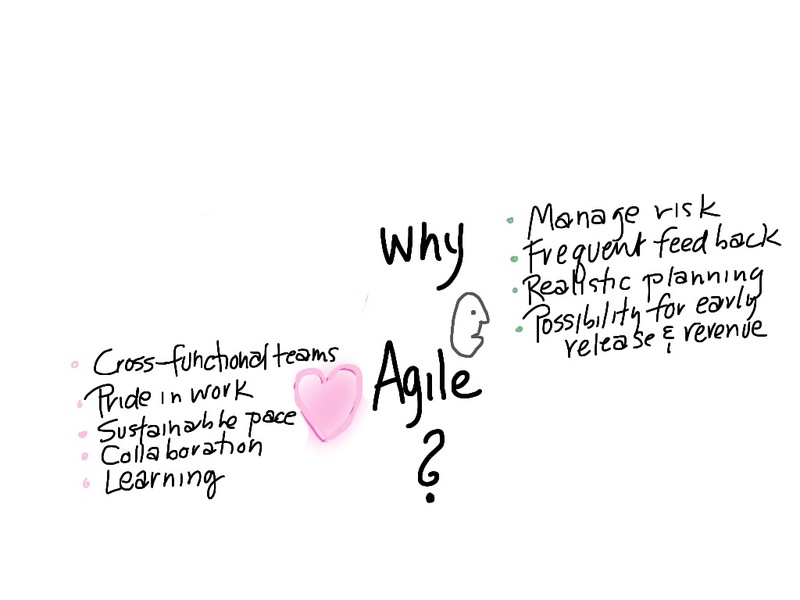 Practically, the focus in agile is on new features and functions. Feature bloat is all too common. Spending time and effort to go from functional to usable is typically hard to sell, especially when the code is done, tested, shippable, and you are faced with a well-prioritized backlog of MMRs. Hence, my preference for lightweight and continuous design feedback during development. 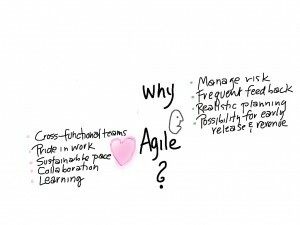 As for tools, agile gives us great methods for managing development work during a sprint. But for the most part, it pre-supposes a well-groomed backlog where stories magically come into the sprint well-defined. The whole process of going from concept to well-defined is severely lacking, especially when compared to the great tools and support agile provides developers. Expanding the scope beyond backlog management, there’s even less agile tools and support for the creative process or managing design decisions.